Its simple and minimalist design style makes a perfect addition to other space. The steel frame, sturdy leg and desktop makes it strong and sturdy enough to provide space for an all-in-one computer. ◆Minimalist design: makes a modern decoration. ◆Wide desktop and leg room: provides ample space for dinner, writing, computer work, study and other home office activities. ◆Adjustable leg pads: the desk leg can adjust 1-2cm height with pad, which makes the desk keep stable even on uneven floor. ◆Easy to assemble: Just need few minutes. ◆Great for home school students, college student. ◆A suitable size for a depart. 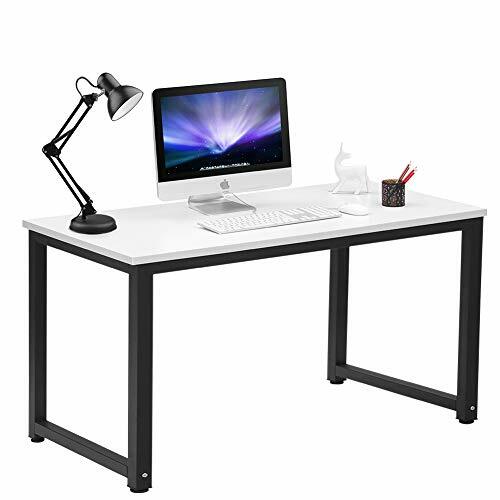 [MODERN SIMPLE LARGE COMPUTER DESK] - 55.1"(L) x 23.6"(W) x 29.1"(H), provide ample space for computer, study and other home office activities. The height is 29.1 inch, plenty of leg room, you can make the best of it in a dorm room. [MINIMALIST DESIGN MULTIFUNCTION] - This simplistic style makes the desk could be used as computer desk, writing desk, study desk, office desk, training desk, dining table, meeting desk and other home office activities. [SUPER STURDY] - The computer frame is made of heavy-duty steel which ensures stability and durability, strong enough to support computer, printer, monitor. Steel legs and adjustable leg pads, made this desk keep stable on uneven floor. You won't feel shaking. [EASY TO ASSEMBLE] - Only need to install the 4 legs and 2 leg bars with Allen key, which will save you valuable time. (Tips: Make sure that you are putting the four legs in the right direction). [USER FRIENDLY] - Panel material is E1 practical board with high glossy finish, healthy, waterproof, and anti-scratch. Steel frame is durable and anti-corrosion. If any problems, please contact us. If you have any questions about this product by Coleshome, contact us by completing and submitting the form below. If you are looking for a specif part number, please include it with your message.